Adult llamas normally have three pairs of front teeth or incisors, located on the lower jaw. The intact male has three pairs of fighting teeth, two upper pairs and one lower pair. In the female, the fighting teeth are usually rudimentary. Males gelded at a young age also tend to have small fighting teeth. 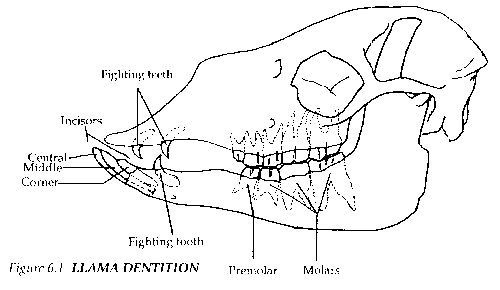 Next, llamas have one to two pairs of premolars on the upper and lower jaw, and three pairs of molars on the upper and lower jaw.1 (Figure 6.1) The premolars and molars are the grinding teeth towards the back of the mouth. They are normally sharp and should not be confused with "points" or abnormally sharp edges. However, since they are sharp, use extreme caution when putting your fingers in the llama's mouth. Llamas, like other mammals, normally lose their baby or deciduous teeth which are then replaced by permanent teeth. It can be very alarming for llama owners to find their llama with a bloody mouth, and a tooth in the feed manger! In general, the permanent central incisors erupt at 2-1/2 years, the middle incisors at 3 to 3-1/2 years, and the last or corner incisors at 4 to 6 years. The fighting teeth erupt at 2 to 7 years, 2 with average being 2-1/2 years. The fighting teeth are very large and pointed in the adult male llama. They can be used as harmful weapons against other llamas or people. For safety reasons, the fighting teeth should be removed or filed off in the male. 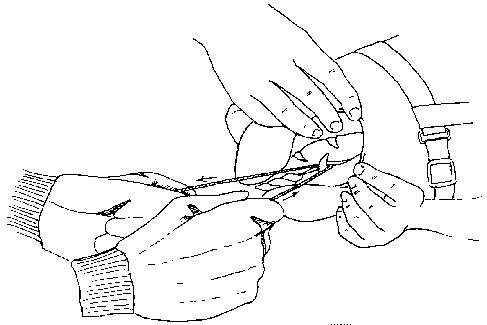 To saw the tooth, the holder keeps the llama's lips open, and the person doing the sawing should form a small loop in the wire and pass this around the tooth. The wire should be kept taut at all times. When the wire is around the tooth, one or two quick pulls parallel to the gum line will cut a groove into the tooth. After the groove is present, the rest of the sawing usually goes very quickly, and the tooth will come off within five seconds or so. Once it is off, check the tooth stub carefully by feeling with a finger. If it is very sharp, it may be necessary to smooth it down, either with a small metal file or with a piece of fabric backed sandpaper wrapped around a finger. Sometimes there will be a small amount of bleeding when a tooth has been cut, often due to damage of the gum, but it will usually stop quickly. This method can be used for both upper and lower fighting teeth. The one modification needed for lower fighting teeth is to be careful to avoid the thin fold of membrane on the tongue side of the lower tooth. If damaged during tooth sawing, this will hurt and bleed. Overly long incisors due to jaw malalignment can be cut for cosmetic reasons and to aid in prehension of food using this same method. However, the teeth are thicker and heavier than the fighting teeth and the sawing will take longer. Also, the friction of sawing produces heat, and since there is a thick section to saw through, the heat produced will be painful. In this case, it is less painful for the llama if a third person can cool the tooth during sawing with a spray of cool water. Before sawing any incisors, consult with your veterinarian because sawing the ends from these teeth may expose the pulp cavity, which increases the likelihood of a tooth infection. As far as dental disease, llamas do not seem to have as many problems as we humans do. Occasionally, a deciduous or baby tooth will not have fallen out by the time the permanent tooth has erupted. The temporary teeth should be loosened gradually. This can be done by rocking them back and forth gently over a period of several days. Then the tooth can be pulled out easily, if it doesn't fall out on its own. If this doesn't work, your veterinarian should pull the tooth. Sometimes llamas who are playing or fighting vigorously will knock out or break a tooth during sparring, which can cause a very bloody mouth. This occurs most commonly with deciduous teeth because their roots are not as extensive and secure as in permanent teeth. Young males may look quite piratical with several chipped or broken baby teeth! Luckily, the broken or missing deciduous teeth will be replaced with permanent teeth as the animal matures. Broken deciduous or permanent teeth should be examined to determine the extent of the problem. Loosened teeth may need to be removed, and the possibility of infection will need to be assessed by your veterinarian. Other dental problems may be marked by the development of a firm, bony lump on the cheek or the jaw. A lump may just be a wad of food but should be examined as it is often indicative of a tooth infection. Any tooth and its root may become infected, but whenever there is damage to a tooth, whether it is broken or sawed off, the risk is a little higher. The bony lump forms in the area of the infected tooth or tooth stump. Infection can be confirmed by X-ray, and if present, it will need medical or possibly surgical attention. Antibiotics are used to combat the infection, but dental surgery to remove the bad tooth is usually indicated. As the llama ages, old or infected teeth often loosen and fall out. When a llama is missing teeth or has irregular wear of the teeth, it will cause problems with the first step of digestion, the mechanical breakdown of food through chewing. Such a llama will begin to lose weight even if it is still eating enough food. Sometimes it will eat less food because the mouth may be sore. When faulty chewing is observed, an oral examination should be done by your veterinarian. It may be necessary to float or file irregular edges on the teeth. If the llama still has trouble chewing or is missing several teeth, it should be fed softened food which does not require extensive chewing. Alfalfa pellets, perhaps mixed with a little grain and softened with water into a gruel make an ideal supplement for those llamas who no longer chew well enough to get the nutrients they need from hay or pasture.